SecondMarket, which helps arrange sales for stock of privately-held companies, said three-fourths of its transactions in the last quarter were for consumer electronics companies. 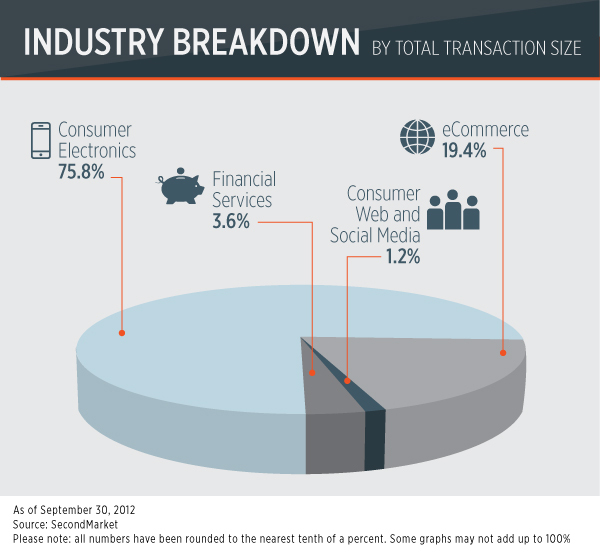 E-commerce made up 19.4 percent of transactions, followed by financial services, which made up 3.6 percent. Consumer web and social media, which made up the bulk of SecondMarket’s deals before Facebook’s IPO this year, is down to 1.2 percent. At the same time last year, consumer web and social media made up 62 percent of transactions. This is partly because of recent IPOs, and partly because companies have been arranging their own private liquidity programs, SecondMarket says. SecondMarket couldn’t say which companies were involved in these transactions, however, because of client confidentiality. Despite losing Facebook this year because of its IPO, SecondMarket said its year-to-date transaction volume is just about where it was a year ago at $418 million for the first three quarters. That’s a 3 percent decrease from the same period a year ago. 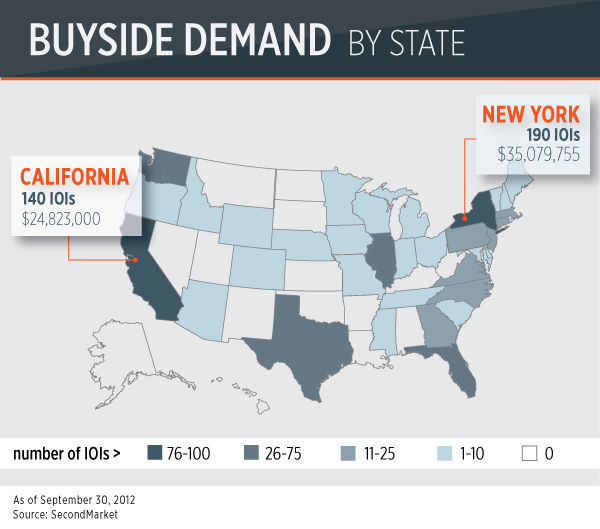 Mirroring this trend, buyside demand has also shifted away from consumer web and social media. The most popular industry that investors submitted IOIs, or indications of interest, to was actually biotech and pharmaceuticals with $77.2 million of interest. That was followed by consumer web, then software, then other, then financial services and payments. 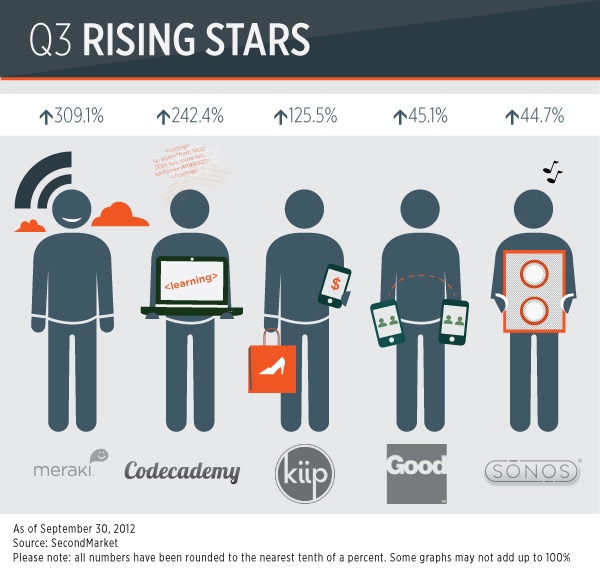 The average company on SecondMarket had a valuation of $538 million, with about $145.7 million raised. 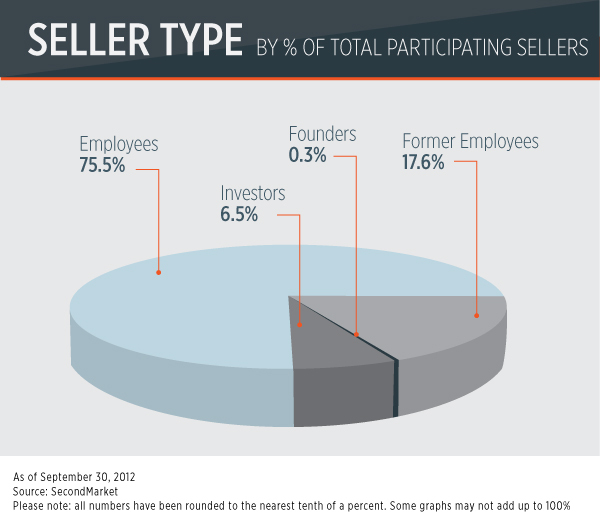 Interestingly enough, as you can see in the buyer and seller charts below, the companies themselves are actually buying back stock from employees. 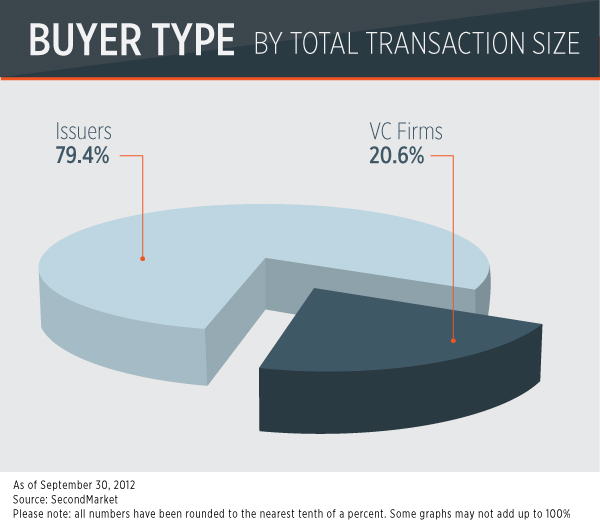 Issuers, or the companies themselves, made up nearly 80 percent of the buyers as they use secondary market liquidity programs to motivate and compensate employees. This also has the added benefit of ensuring that sensitive financial information about the company doesn’t end up in front of more distant, less trustworthy shareholders. It can also help the company from bumping up against rules that limit the number of shareholders they can have before they have to release financial reports as if they were a public company. This upper limit used to be 500 last year, but it was bumped up when the JOBS Act was passed last year. As for the earlier-stage companies on the SecondMarket platform, Meraki, the network infrastructure company, saw the biggest increase in investor interest with a 309 percent increase in watchers. 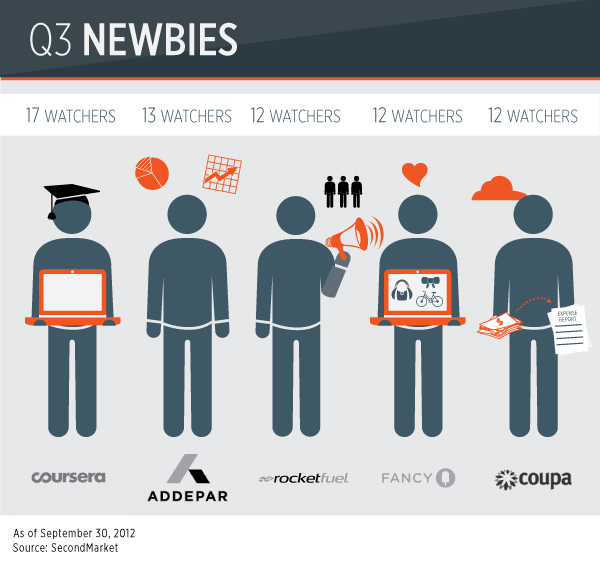 Codecademy, a New York-based company that offers online programming education, took the second spot, with a 242 percent increase in watchers. Mobile advertising company Kiip, which gives gamers rewards when they level up or win, saw a 104 percent increase in interest. In fourth and fifth place were Good Technology, which focuses on mobile device management and security, and then Sonos, the Santa Barbara-based speaker company. The five newest companies that saw the most investor interest were online education startup Coursera, finance startup Addepar, New York-based digital advertising startup Rocket Fuel, the style hub, Fancy, and Coupa Software, which provides cloud spend management solutions.